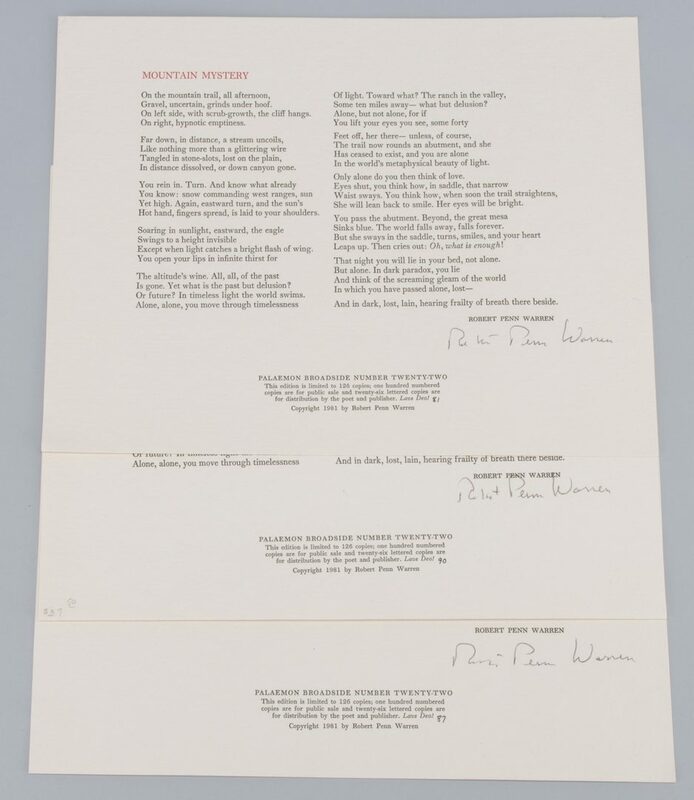 1st-4th items: Four poetry broadsides of "Mountain Mystery" signed by Robert Penn Warren, published by Palaemon Press, Winston-Salem, 1981. Numbered 81, 87, 89, and 90 out of a limited edition of 126. Signed lower right under poem.Three unframed, one housed in contemporary black frame. 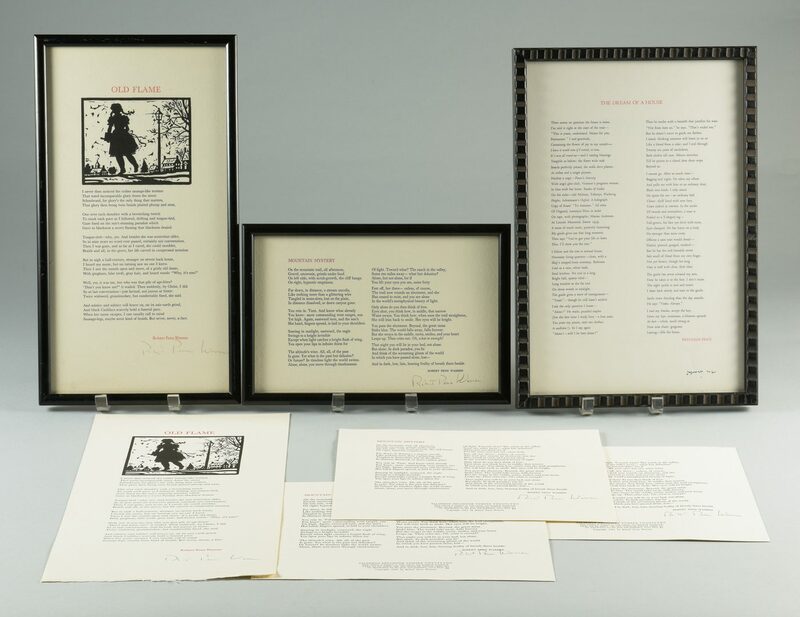 Edition information and number cut from lower section of framed poem, label en verso.Unframed – 9" H x 11 5/8" W. Sight – 7 3/8" H x 11 1/8" W. Framed – 8 3/8" H x 12 3/8" W. 5th-6th items: Two poetry broadsides of "Old Flame" signed by Robert Penn Warren, published by Palaemon Press, Winston-Salem, 1978. One numbered 83 out of a limited edition of 126, information en verso. Signed lower right under poem. One unframed, one framed in contemporary black frame. 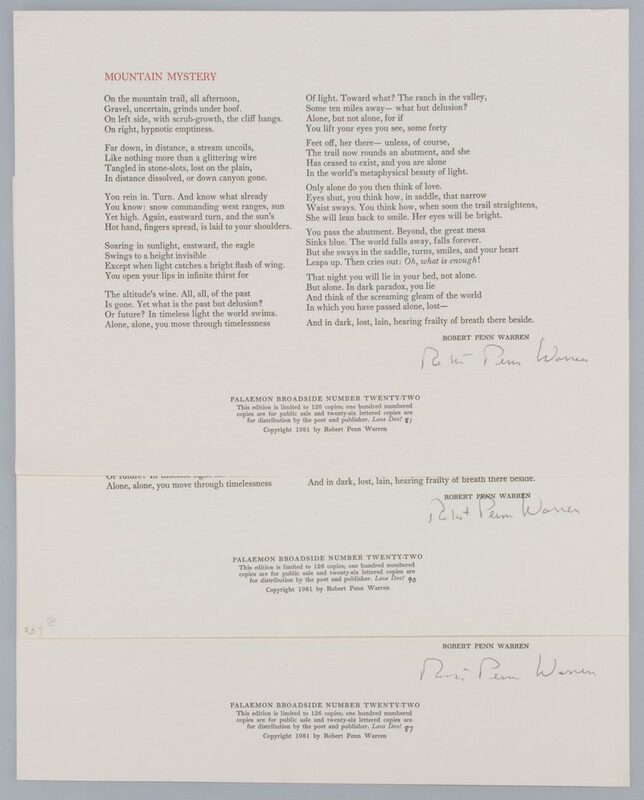 Unframed – 16" H x 8 7/8" W. Sight – 15 7/8" H x 8 1/8" W. Framed – 17 7/8" H x 9 1/4" W. 7th item: Poetry broadside of "The Dream of a House" signed by Reynolds Price, published by Palaemon Press, Winston-Salem, 1977.Signed lower right under poem. Numbered out of a limited edition of 126, information en verso. Housed in a contemporary black frame. Sight – 15 1/8" H x 9 3/4" W. Framed – 16 3/8" H x 11 1/8" W. All items late 20th century. Provenance: Collection of Charles and Ann Wells, Nashville, Tennessee. CONDITION: 1st-4th items: Two minute brown spots, left edge of one unframed poem. Framed poem not examined out of frame. 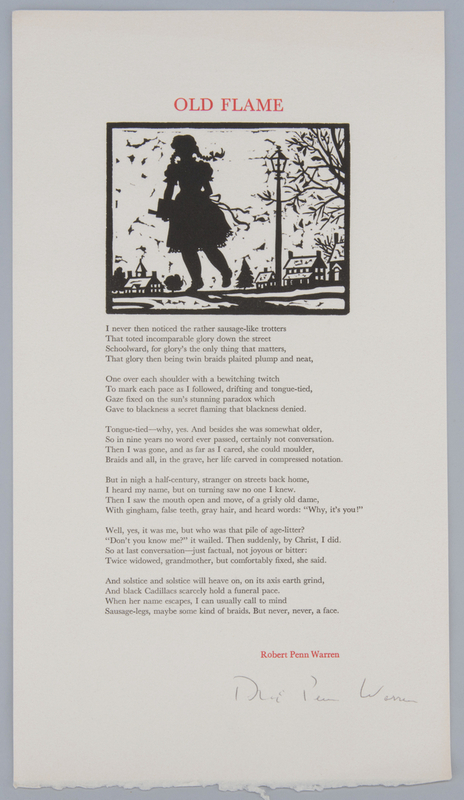 5th-6th items: Slight toning around edges of unframed poem. Water damage, lower edge of frame poem. Lower edge of frame loose. Not examined out of frame. 7th item: Overall excellent condition. Not examined out of frame.